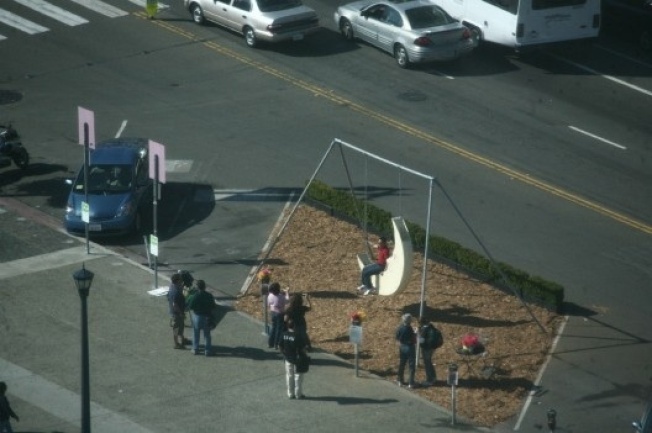 Swinging on a moon in the middle of the street. PARK(ing) Day— that totally legal-ish guerrilla event transforming street parking into miniature parks — returns tomorrow. Last year's PARK(ing) Day San Francisco brought us people swinging on a moon, a bicycle-powered smoothie maker, simple grass lots, and some sort of pedal-powered light-bulb demonstration. Well, there was a lot more than that. Do your part, lunch-hour photojournalists and funemployment beneficiaries: check out the official map for San Francisco spots, then send your PARK(ing) Day shots to us.